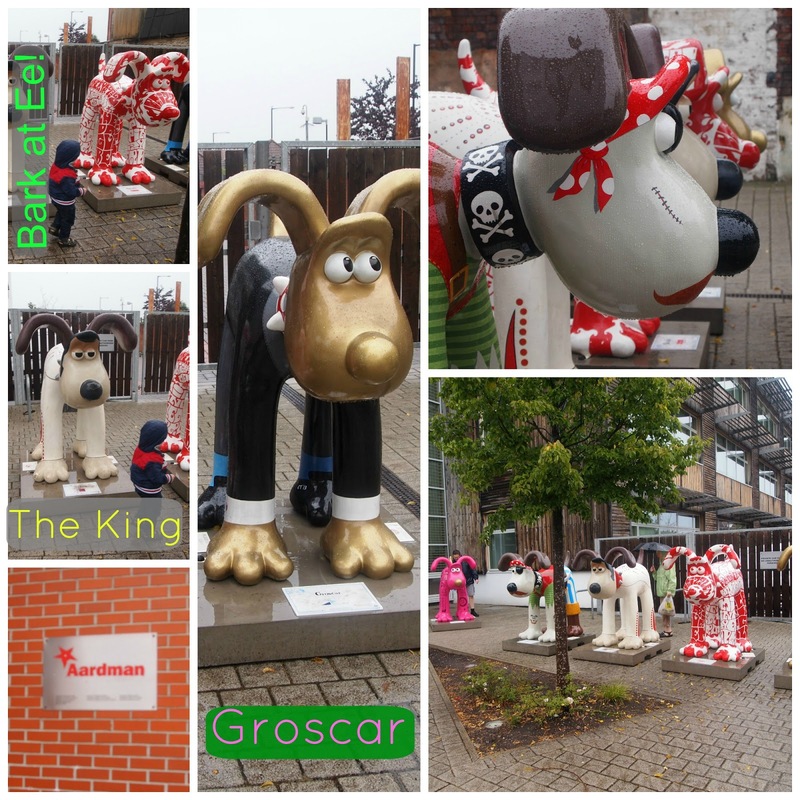 So... this will pretty much be a picspam about the weekend, which involved seeing 38 Gromits (although only 35 photographed...) and a lot of swashbuckling. At the beginning of picture taking, D was a little unsure where to stand and would follow directions - by the end he was hiding behind the legs, cheekily looking out and 'cheese'ing. Hilarious. 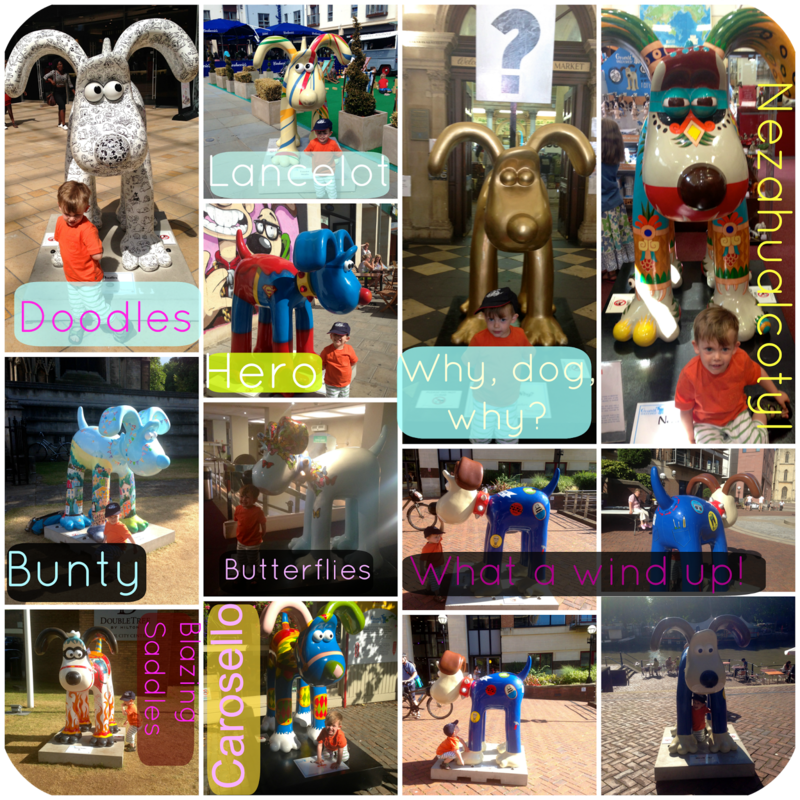 Gromit Unleashed! is designed to raise money for Bristol Children's Hospital. 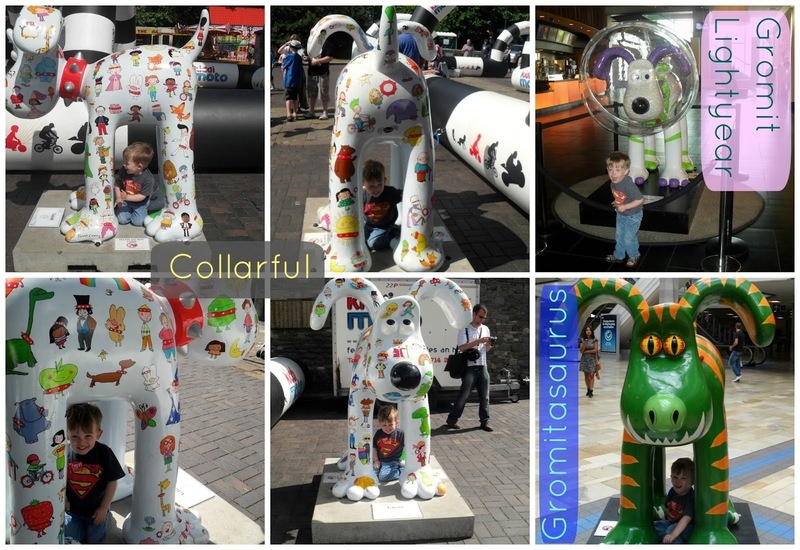 It's a collection of 80 different Gromits, designed by a variety of artists from Harry Hill to Axel Scheffler, Zayn Malik to Sir Quentin Blake. At the end of the run, all of the Gromits will be auctioned. 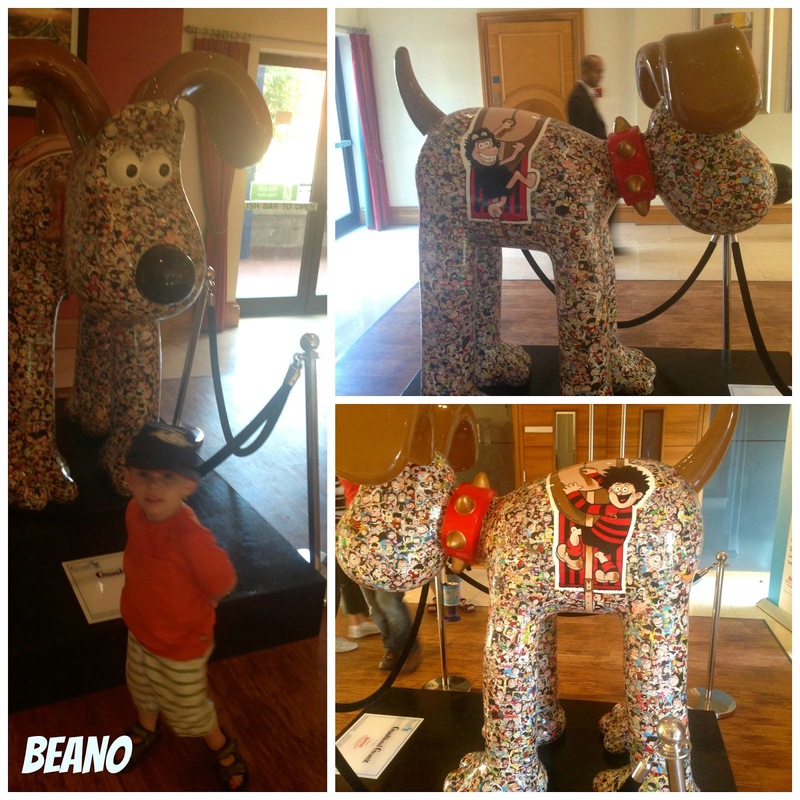 During the installation, you can buy an app to help you find the Gromits, with proceeds to the charity, or buy an array of souvenirs, including miniature versions of some of the pieces. 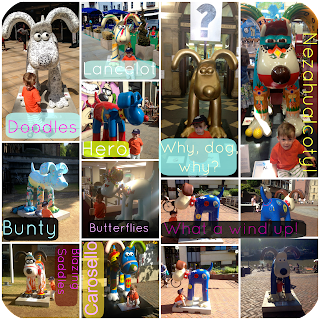 What's great about it, beyond the charity element, is that it gets you to really explore Bristol. We found Creative Common whilst searching for the Gromit I shared yesterday. We were lucky enough to see the artist working on Bunty - touching up where he was a bit weathered. She was really friendly and happy to talk to anyone who was visiting. Husband claims this as his favourite. On Saturday we continued the trail. The one in the middle is called 'National Treasure' and is made up of coins. Grosmos at the top was actually a Friday one, hence the different outfits! Saturday was also about the Harbour festival and a trip to the stalls on Queen's Square. Lunch purchases included a huge tapas plate from the stall with the flamenco dancer on the top. It was laden with pesto pasta, falafels couscous salad and more. While it held a lot of promise as a concept I was a little disappointed in the execution. 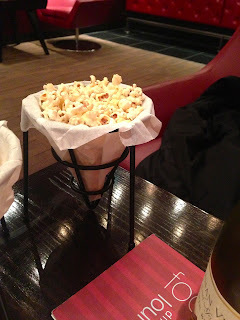 Nothing felt particularly authentic and it didn't have the level of flavour I would have liked. A complete lack of tomatillo sauce as promised on the patatas bravas too. We also had to visit the Hippy Chippy - where they make the best chunky chips served with a large serving of dip - in this case sour cream. Unfortunately, it was also served with a downpour. Not enough to send everyone running away and in fact, quite refreshing at first. The rain continued and it continued and it continued. D became quite grumpy. Well, until we got him a poncho. Best £1 spent ever. Ponchos purchased, it was time to watch some of the displays. A lot of speedboats doing tricks gained D's attention and he found it hilarious when they all splashed him. To be fair, he was pretty wet by this point anyway. He did tell them off for being naughty though! 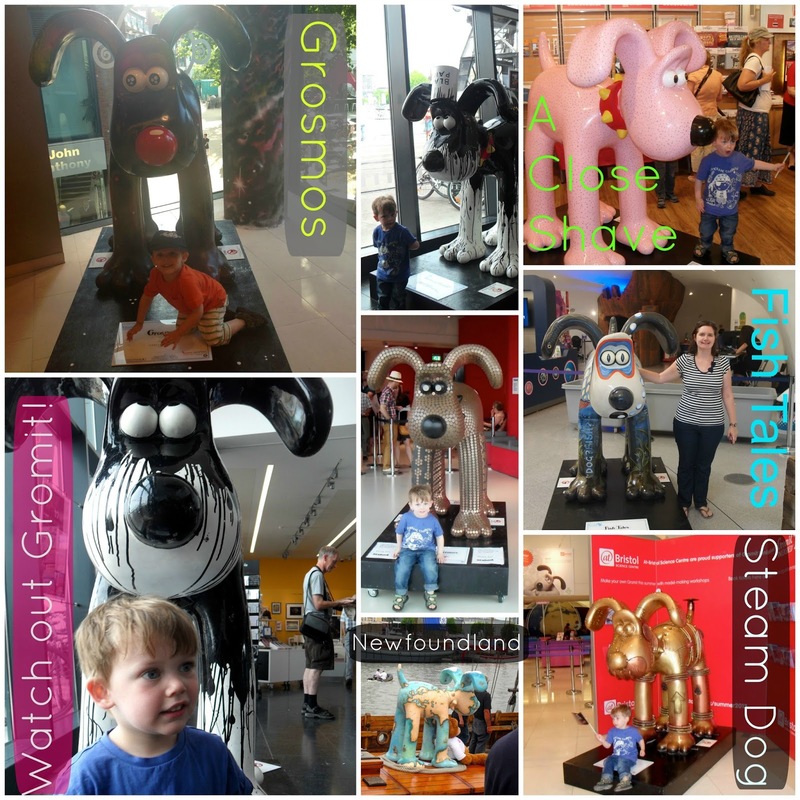 After this, we set off for a final bit of Gromit-hunting. As a result of the festival, four of them were re-located to the front of Aardman studios, alongside Stats the way to do it, Lad! 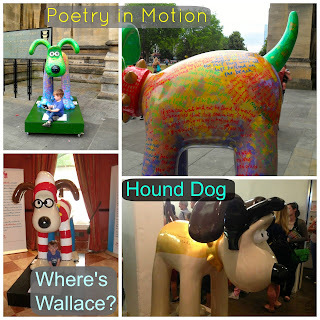 - a brilliant Gromit with all of the statistics you could possibly hope for. 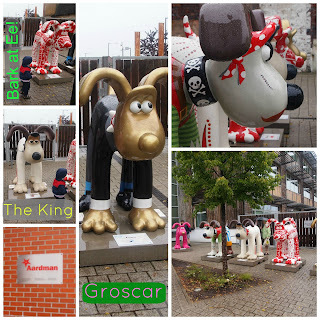 D's favourite Gromit was 'Bark at Ee' a Gromit dedicated to Bristolianisms. D thought it looked like fire and commented on this repeatedly. 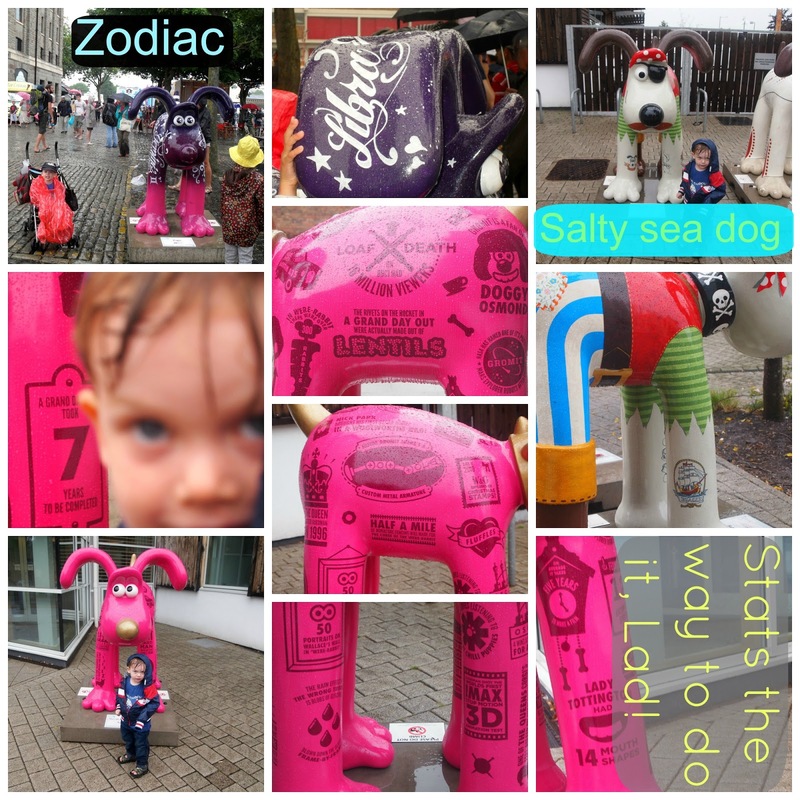 Given the state of him at this point (really quite sodden) it is remarkable the speed with which he ran from the car to the Gromits and the reluctance he had returning to the car. Saturday evening involved a spot of babysitting by the mother-in-law while we got to see The World's End in the Director's Hall at Showcase. It was brilliant, although the ceiling began to drip before the end of the trailers. To the credit of the staff, the problem was dealt with very swiftly and our enjoyment of the film was not affected. Less impressive were TGI Fridays. They opened at the beginning of the month and our quick trip in to pick up a cocktail was dashed - the bar staff were clearly overstretched and struggling with the cocktail menu. After fifteen minutes in which we weren't even acknowledged, we left. Our final spot was Golden Gromit outside the Victoria Rooms. Instead, we spent a bit of time 'squashbuckling'. 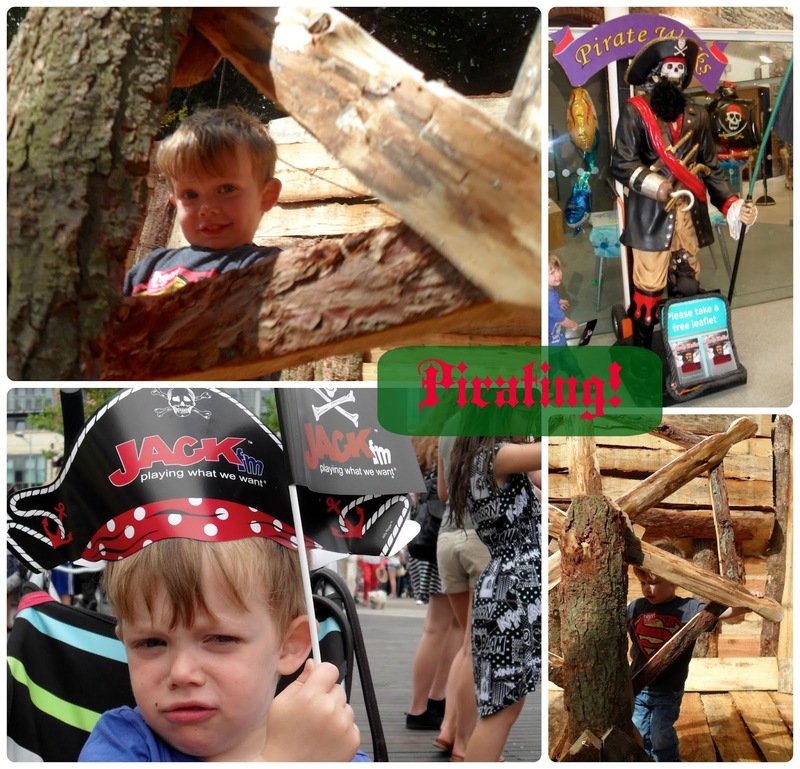 D loved climbing about the natural pirate ship created in Castle Park and decorating his own scale for a sea monster. We also saw some of the circus acts at the other end of Castle Park - managing to escape before the rain hit early evening. 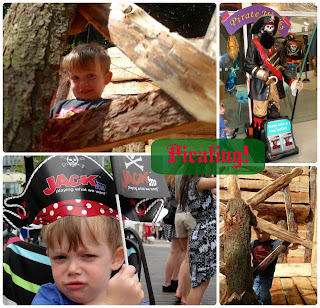 While the Harbour festival is now over until next year (and I'd strongly recommend you go! 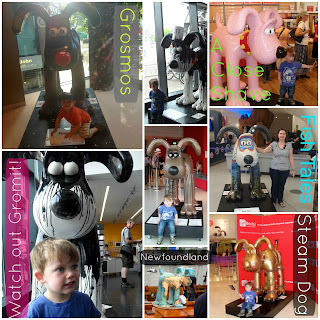 ), Gromit Unleashed continues until the 8th of September. We have already planned to return and try to collect some more - although they are all a bit further afield now. 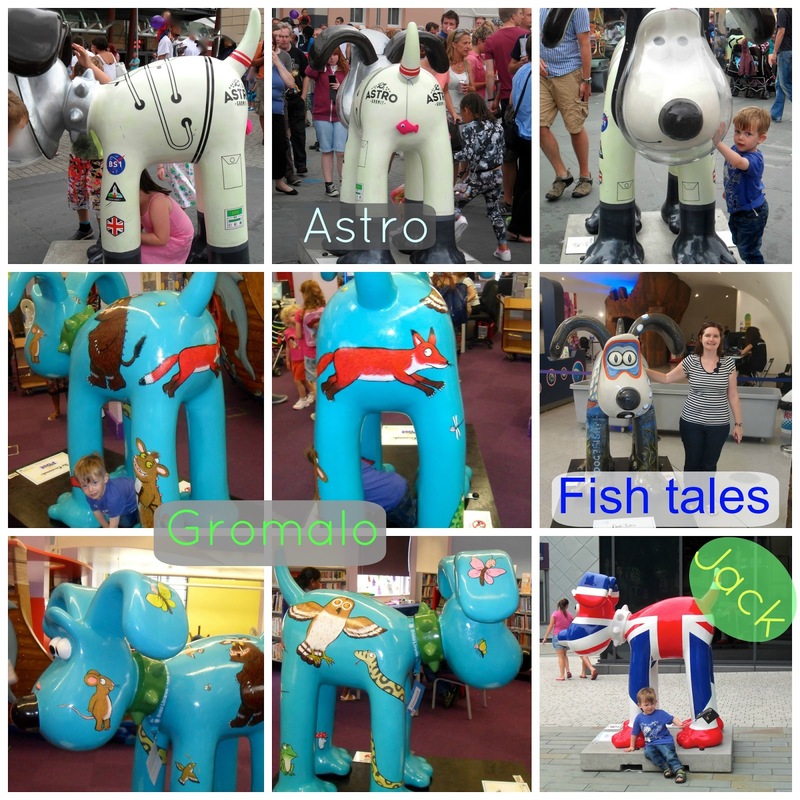 We might even make the trip to Cheddar Gorge and we will more than likely get to Paddington station to see the 'normal' Gromit. It's a bit addictive once you've started - I'm definitely a ticker offer! 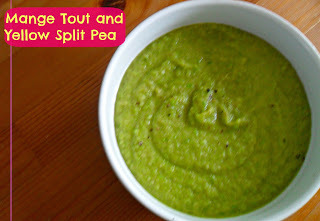 Sunday Monday soup this week was mange tout and yellow split pea. As I didn't deviate from the recipe in the book very much, I'm not going to share it. D and I ate it both up but at 6pp a bowl, it was not in line with my usual guidelines for soups on here. It only made two servings, so I may need to make another batch later in the week. Over the summer, meal planning will be a little less rigid in the day as I don't need to pack everything in the bag in advance. So evening meals are all I'm properly planning at the moment. On a side note, as a result of testing and anniversarying, I'm not sure when my next weigh in will be. I'm still mostly on track but have no definite weigh-ins.